Did you know that Aleister Crowley's favourite cocktail contained a serious narcotic? He used to drink it at the pub pictured above, which is one of the haunts you can visit on a series of walks being organised through Treadwells next month. 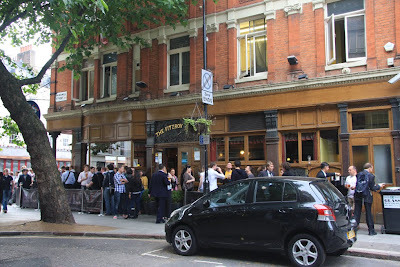 As well as taking walkers on a crawl of Aleister Crowley's favourite pubs - and revealing the secret recipe for Aleister Crowley's narcotic tipple - tour guide Paula Dempsey will be showing the place where the Golden Dawn was formed and a site that has fallen foul of an ancient Egyptian curse - all within striking distance of one of London's best occult bookshops. She will also be talking about the Rosicrucians, John Dee, the Freemasons and Harry Price - the things they got up to, who they fell out with and what supernatural entities they may have had dealings with in England's magical capital city. Treadwells describes the tours as being designed for those who already know a thing or two about the occult; who "know the main characters of British magic and want more quirky tales about their London adventures". Tour guide Paula Dempsey is a good friend of mine and I was delighted to be invited along to a preview of her walk. I thought it would be good before I went on it, as Paula has a superb knowledge of London's folklore and occult history. If there are ever any little facts on the subject that I'm trying to recall but can't quite remember, Paula is the person I ask. My only regret about the event is that there wasn't time to actually stop off at any of the pubs along the route to raise a toast to Uncle Al. I'm sure he would have appreciated it if we had, even if narcotic cocktails are no longer allowed on the drinks list. Paula Dempsey is also the author of the just-published Investigator's Guide to Occult London - written as a sourcebook for players of Lovecraftian roleplaying games, but full of well-researched information about the city's mysterious past. The dates are: Tuesday 12 July, starting 7pm; Thursday 21 July, 7pm; Saturday 13 August, 2pm; Thursday 25 August, 7pm. Please get to Treadwells at 6.50pm at the latest for walks starting at 7pm. 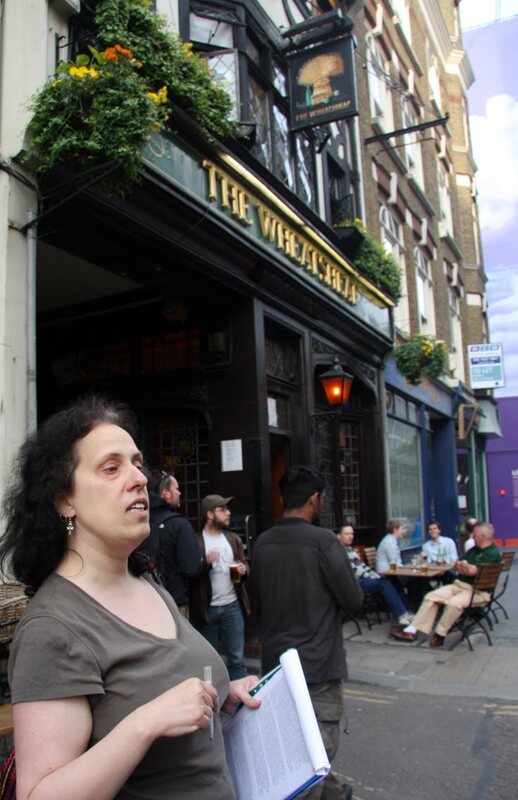 The pictures show pubs visited on the walk where Aleister Crowley enjoyed a drink or a few. Paula Dempsey is in the foreground of the picture to the left. I'm not surprised about his choice in cocktails; besides his personality, this was an age where you could buy Heroin over-the-counter in your average pharmacy. As always, too bad I'm on the wrong side of the pond to go on this tour, it sounds hell of interesting. Wow this sounds like a very interesting and worthwhile guide to take. I can't quite justify the cost of getting to London for it though as much as I'd like to. That cocktail sounds particularly interesting, such a pity about the health and safety rules these days! The history of Great Britain is, without doubt, one of the most interesting in Europe. Its well known royal and political figures, alongside the many events that shaped the history of this small island makes it one of the most commanding and entrepreneurial nations of our time. The influence of its imperialistic past, combined with the emigration of parts of the population, has meant that Great Britain has helped to shape global as well as national history.